In the end, it wasn't Dean Heller or Mike Lee or any of the other leading suspects who ultimately picked up the knife and killed Republicans' efforts to repeal the Affordable Care Act. It was Sen. John McCain, who has never been especially active on health care and whose presence in the Senate this week was itself a surprise, following his diagnosis with brain cancer. McCain held out despite intense lobbying from Vice President Mike Pence. Leadership held a separate vote open for almost an hour as Pence stood at McCain's desk, making his case. But the writing was on the wall almost as soon as McCain entered the Senate chamber last night and said something that put a smile on Sen. Chuck Schumer's face. GOP leaders were also lobbying Sen. Lisa Murkowski, a more entrenched "no" vote, before the bill failed. But neither she nor McCain seemed flustered, even as the pressure wore on. "It did have the makings of a good movie there for a while. I'm just glad that we can try to move on," a senior GOP aide told our colleague Caitlin Owens after the vote. What comes next: Conservatives were particularly stung by last night's defeat, and said they would keep up the pressure for some sort of action on repeal. But, realistically, it's hard to see leaders in either chamber wading back into such a bruising fight any time soon. 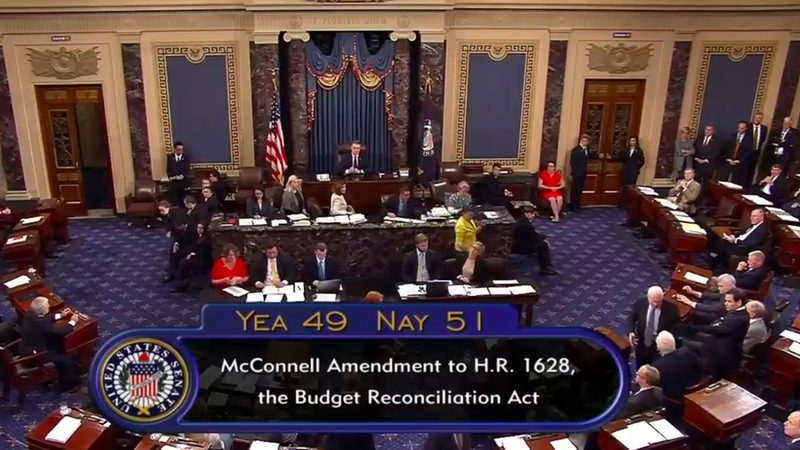 "It's time to move on," an emotional Mitch McConnell said as he closed out the Senate's session. Democrats have been saying they're eager to work with Republicans to stabilize the ACA's marketplaces, and there's a stable of Republicans (like Sen. Lamar Alexander) who likely will now be willing to tackle short-term stabilization plans. But all Democrats have offered so far are plans to pump more money into the program, and it'll soon be time to walk the walk on that whole bipartisanship thing. Decision time for Trump: Health and Human Services Secretary Tom Price put an awful lot of stock in his party's efforts to repeal the Affordable Care Act. His department has produced taxpayer-funded videos about how bad the law is; he has criticized it on TV; he helped lobby lawmakers to pass a repeal bill. Wriggling out of that awkward position — trash-talking a law you're in charge of carrying out — wouldn't have been too hard if repeal had passed. But now, Price and the rest of the administration will have to make a real-world, non-hypothetical decision between undermining the law and trying to make it work. Cost-sharing subsidies: Trump has been paying out the subsidies one month at a time, without funding from Congress, despite insurers' pleas for a longer-term commitment. If he stops those payments, premiums will skyrocket even more than they already have. Enrollment outreach: The ACA is performing unevenly even after the Obama administration pulled out every trick it could think of to try to get young, healthy people to sign up — and Price is already rolling back those outreach efforts. Mandate enforcement: Trump has signaled he doesn't want the IRS to break a sweat enforcing the individual mandate — another tool to help improve the misaligned risk pools that are contributing to premium hikes in the exchanges.